Daniel O'Donnell - "We had great fun filming these scenes"
Daniel O'Donnell is to make his acting debut next month as a guest star in TG4 soap Ros na Rún. He will appear on the show on Thursday May 3 at 8:30pm when entrepreneur Vince asks the singer to open his new Siopa XL. Bobbi Lee is keen on showing off her singing skills; Máire wants Daniel to stay in her B&B and Tadhg invites him for a drink in the pub. Will Daniel stick around or hightail it once the ribbon is cut? Will Daniel accept Tadhg's offer? O'Donnell said he had "great fun" filming the episode. "I'm a big fan of Ros na Rún and to see it in reality, it's an impressive production," he continued. "Growing up in Kincasslagh in Donegal, Irish language was always an integral part of the fabric of the community, so it personally gives me a great sense of pride to work in our native language. "I'm looking forward to tuning in on Thursday night." "I'm looking forward to tuning in on Thursday night"
O'Donnell is following in the footsteps of fellow singer Nathan Carter, actor and presenter Stephen Fry and hotelier Francis Brennan by making a cameo on Ros na Rún. 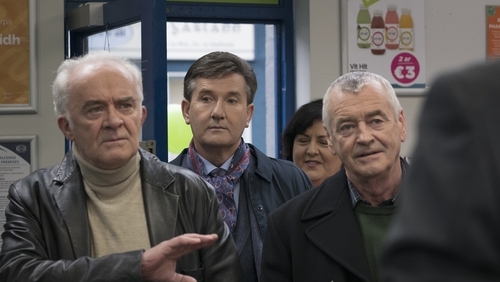 Ros na Rún airs on TG4 on Tuesdays and Thursdays at 8:30pm, with the omnibus on Sundays at 7:30pm. For more on this week's big soap stories, click here.